After a few months’ hiatus due to knee surgery, Roger Federer is once again holding court. 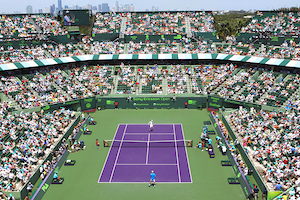 His initial stop is the Miami Open which marks the two time champion’s return to the Magic City since 2014. In his first match, the 17 time major holder squares off against Juan Martin Del Potro the 2009 U.S. Open winner. The Argentine himself is on the road back from injury after a second wrist surgery sidelined him for almost two years. Del Potro bounced fellow countryman Guido Pella in straight sets last evening in order to book a second round date with the Swiss. 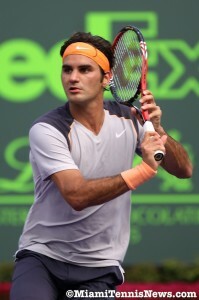 Federer leads in their head to head 15-5. However, of late, their matches have been quite close with Del Potro besting Federer at home to take the title in Basel in 2012 and 2013. At today’s press conference preceding this marquee showdown, Federer discussed a myriad of topics including the upcoming match. Federer’s campaign for the Miami Open title will be treacherous with world number one Novak Djokovic a likely semifinal rival should he get that far. The Swiss master’s first ball strike is on Friday.